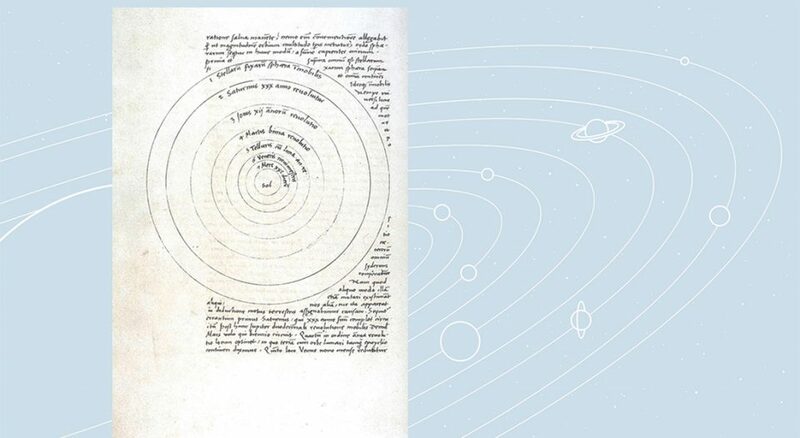 Heliocentric model of the solar system in Nicolaus Copernicus' manuscript, "On the Revolutions of the Heavenly Spheres." Several seminary instructors had been invited to talk at a college’s “Darwin Day” about our project to bring science into the core seminary curriculum. From the audience we heard stories of students who were told they needed to reject any concept of God to become credible scientists. We also heard stories of students who were told they needed to reject basic scientific discoveries to remain in their faith communities. Those stories were disturbing, and our curriculum project was aimed at making healthier stories more common—helping future faith leaders grow beyond being dismissive or fearful of science. But we wondered how congregations might be more welcoming places for scientists and scientist-wannabes. And I remembered a story I had heard years earlier. The calendar of commemorations is among the most ignored parts of the hymnal. It honors, usually on the date of their death, major figures from the church’s history, giving us a chance to learn from them and include them in our prayers of thanksgiving. They’re chosen to represent as many centuries and continents as possible, but almost all of them are pastors, theologians and other sorts of professional church people. Those for May 24 are an exception. On that day we remember two faithful Christians and dedicated church members whose day job was as scientists. Neither Copernicus nor Euler needed to abandon his faith to live out his occupation. In fact, both recognized their scientific careers as ways they lived out their baptism. Nicolaus Copernicus, who died May 24, 1543, is best known for imagining that the earth is not the center of the universe—that it, and the other planets, revolve around the sun. While he didn’t publish this theory until just before his death, he developed it almost 40 years earlier, and rumors of it soon spread all over Europe. This radical new theory didn’t affect Copernicus’ personal or professional relationships with the church. But the relationship between Copernicus and the church wasn’t entirely friendly. Luther made an offhand remark about him in a sermon: “There is talk of a new astrologer who wants to prove that the earth moves and goes around instead of the sky, the sun, the moon …. But that is how things are nowadays: when a man wishes to be clever he must needs invent something special, and the way he does it must needs be the best!” And, 70 years after Copernicus’ death and the publication of his book, his own church condemned and banned it. Overall, though, the immediate reaction was quite different. Philipp Melanchthon sent astronomy students to study with Copernicus, and Luther’s colleague Andreas Osiander published his book, with a preface praising and defending its thesis. And Copernicus and his theory were defended heartily by Roman Catholic bishops and cardinals. The Copernican revolution has even become a metaphor for the Protestant Reformation, which understood itself to put God, rather than humanity, at the center of the universe. Leonhard Euler (1707-1783) is also commemorated on May 24, and he is far less known than Copernicus. But he was at least as fervent a church member and Christian. He was one of the greatest mathematicians who ever lived. Euler made contributions to almost every branch of mathematics, several of which he actually invented. Space doesn’t allow for an explanation of his contributions, but he is the only person who has two numbers named after him. For those who understand mathematical notation, imagine working without e, i or y! Neither Copernicus nor Euler needed to abandon his faith to live out his occupation. In fact, both recognized their scientific careers as ways they lived out their baptism. Commemorating them, even just mentioning their life and work in church, is a small step toward welcoming and encouraging present and future scientists. Rather than fear scientific investigation, it would be clear that the church is confident enough in its God and members to welcome it. nor fear the vast unknown. you will not search alone. Mark Oldenburg is the Steck-Miller Professor of the Art of Worship and dean of the Gettysburg Chapel for United Lutheran Seminary.